Russian President Vladimir Putin has inspected the country's biggest military drills since Soviet times, involving around 160,000 troops. The manoeuvres, in Russia's Far East, are part of efforts to boost military mobility and combat readiness. Deputy Defence Minister Anatoly Antonov said that the exercise was not directed against any particular nation. Mr Antonov said Russia warned its neighbours about the exercise and provided detailed information to China. The two countries have an agreement that envisages a mutual exchange of data about military activities along their border. Russia's army has been undergoing drills in its central and eastern military districts for several days. State-owned daily Rossiyskaya Gazeta described the drills as "the most intensive combat readiness check in the modern history of the Russian army". 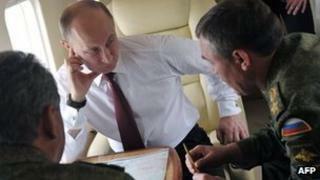 President Putin watched some of the drills on Tuesday on Sakhalin Island in the Pacific, just north of Japan. The land part of the exercise is directed at China, while the sea and island part of it is aimed at Japan. Konstantin Sivkov, a retired officer of the Russian military's General Staff, told the daily Nezavisimaya Gazeta that "the Sakhalin part of the manoeuvres was intended to simulate a response to a hypothetical attack by Japanese and US forces." Deputy Defence Minister Antonov said "the large-scale military exercise by the Russian Armed Forces in the Far East is not a flexing of muscles, but work to enhance the army's combat readiness". At a meeting with foreign military attaches accredited in Moscow, Mr Antonov explained why the exercise was necessary and said the drills were "not directed against other states' interests". Mr Antonov also stressed that "the Russian side showed maximum openness" during the drills and that "extensive information about the exercise is being supplied to the media". However some experts voiced concerns that the massive exercise held in the areas along the border with China could be aimed at Beijing. Mr Khramchikhin said that the war games were intended to discourage China from harbouring expansionist plots. The two Cold war-era rivals have forged what they described as a "strategic partnership'' since the 1991 Soviet collapse, developing close political, economic and military ties in a shared aspiration to counter US power around the world. Russia has supplied sophisticated weapons to China, and the neighbours have conducted joint military drills, most recently a naval exercise in the Sea of Japan earlier this month. But despite close economic ties and military cooperation, many in Russia have felt increasingly uneasy about the growing might of its giant eastern neighbour. The Russian military drills are expected to continue in the country's Far East until 20 July.